The US failed to secure agreement on a ceasefire to end 18 days of fighting between Israel and Hamas in Gaza on Friday night but insisted that efforts were continuing to arrange a humanitarian truce in time for a Muslim holiday early next week. John Kerry, the US secretary of state, said he was confident of a breakthrough despite a reported decision by Israel’s cabinet to reject the proposed terms. Israeli officials later announced a 12-hour “pause” from 8am on Saturday. Hamas was said to have agreed, according to al-Quds TV. But in one of a flurry of contradictory moves, Israel’s defence minister also warned that the army was preparing to expand ground operations in the coastal enclave, where the offensive has already claimed almost 900 Palestinian lives, three-quarters of them civilians. Israeli tank shelling killed 18 Palestinians from a single family in southern Gaza on Saturday, Reuters reported, shortly before the 12-hour pause came into effect. Gaza health ministry spokesman Ashraf Al-Qidra said that the Al-Najar family had been trapped inside their house in Khuzaa village east of Khan Younis since Thursday and that many others were wounded in Israeli tank shelling. Hamas has also signalled its opposition to the terms of the US ceasefire plan, which it deemed too favourable to Israel. Its leader, Khaled Meshaal, has insisted on an end to the siege of Gaza; Israel on an end to cross-border attacks. The gap between the two sides remains wide. “We are working toward a brief seven days of peace,” Kerry said in Cairo. “Seven days of a humanitarian ceasefire in honour of Eid in order to be able to bring people together to try to work to create a more durable, sustainable ceasefire for the long run. From Cairo, Kerry will fly to Paris, where he will meet officials from France, the UK and EU as well as Turkey and Qatar – two countries with influence over Hamas. “The whole world is watching tragic moment after tragic moment unfold and wondering when everyone is going to come to the their senses,” he said. Underlining the scale of the crisis, Unrwa, the UN refugee agency, said 160,000 people were now seeking shelter at its facilities. Palestinian militants again fired rockets from Gaza, triggering sirens across southern and central Israel, including at the main airport. No injuries were reported, with the Iron Dome interceptor system knocking out many of the missiles. Israel army radio reported that Binyamin Netanyahu and his cabinet had been divided over the wisdom of accepting Kerry’s proposal, which was supported by the UN secretary-general, Ban Ki-moon. 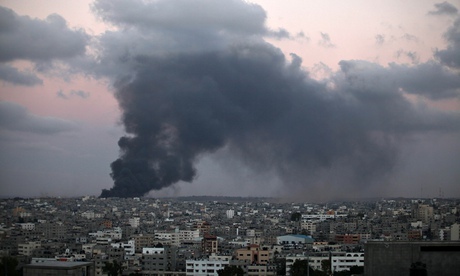 Hawkish ministers were said to favour widening the ground operation in Gaza and warning against any gain for Hamas. Under the US plan, Israeli troops could stay behind after a ceasefire to continue destroying cross-border tunnels. A week-long truce would be followed by talks on more permanent arrangements, under Egyptian supervision. General Sami Turgeman, head of Israel’s southern command, said his forces needed more time to destroy the tunnels. Hinting at the growing pressure for a ceasefire, he said: “We know that there are other timetables that can affect us, and we will use all the time that we have at our disposal.” Turgeman said Hamas fighters were in poor shape and were finding it harder to launch rockets into Israel. At least five West Bank deaths on Friday followed a big demonstration on Thursday night at the Qalandiya checkpoint between Jerusalem and Ramallah, in which 10,000 demonstrators marched in solidarity with Gaza. Two men were shot dead by Israeli troops and about 250 people injured, mostly from gunshots. “Ambulances were coming every minute,” said a doctor in the hospital’s emergency department. “We have seen this before but not since the intifada,” he said, referring to the last Palestinian uprising. Gaza officials said Israeli strikes killed 55 Palestinians on Friday, including the head of media operations for Hamas and his son. Israel announced that an army reservist had been killed in Gaza, bringing to 34 the number of soldiers lost since its ground offensive began. The Israeli military said that one of its soldiers who had been missing since a battle in Shujai’iya on Sunday was dead. “Oron Shaul is defined as ‘a soldier killed in action whose burial site is unknown’,” said an Israel Defence Forces statement. The soldier was in an armoured vehicle ambushed by Palestinians. The bodies of six other infantrymen were recovered but Shaul’s fate had been unclear. If Hamas is holding Shaul’s body, that may give the group leverage in bargaining for the release of prisoners which it is demanding as part of a ceasefire deal. Unrwa issued a strongly worded statement about the Israeli military when a team including an international weapons expert visited the school at Beit Hanoun which came under attack on Thursday, causing at least 15 deaths and 200 injuries. “The aim of the visit to the site was to survey the scene in the aftermath of the incident,” Unrwa said. Violence in the Palestinian territories was echoed in neighbouring Jordan, where about 2,000 people demonstrated in Amman after Friday prayers, chanting: “We sacrifice our blood and souls for you, Gaza” and “Bomb and destroy Tel Aviv.” Protests were held in the northern cities of Zarqa and Irbid as well as in the south, in Karak. In Iran hundreds of thousands of people took part in nationwide rallies in solidarity with Palestinians. Images showed demonstrators holding banners, such as one reading “Stop killing babies in Gaza”. A group of demonstrators set fire to Israeli flags and carried puppets of Israeli and American officials.